Please check the readmes in the zips for installation and current features. The remaing post is the original thread content w/o links. Please respect that not all information may match the current versions of the plugin. You have to read the whole thread to get an idea about the development cycle. Here is an other little filetype to play with: see top of the post. Loads and saves animated gif files. .dll and .dlc files must be copied to FileTypes folder. Warning: Paint.NET does not like that two filetpye plugins support the same extension. So switch off AnimGIF.dll. Warning 2: The file extension of the animations must be .agif not just .gif. - Frames may use individual delays and comments. - Background and Foreground layers may be rendered to the frames (Makes it easy to add an overlay text to an animation). Disadvantages in this test version: Only 255 colors are allowed because I switched off the color quantization off which is way to slow in the moment. All attributes to control the animation are stored in the layer titles after the marker //. Attributes must be separated with a semicolon character. Load reads some attributes from the file and adds them to the layer titles. 0 means infinite. If not defined then infinite will be assumed. Defines the amount of time N in ms until the next frame of the animation will be shown. If not defined then the duration of the previous frame will be assumed. Instead of 'duration=N' you may use 'N ms'. The initial duration is 0.
with anything below that being rounded up to 0.10 s.
This means Firefox supports a maximum frame rate of 50fps. Where A is an ASCII string. If a character is not in ASCII then it will be replaced. empty comment to the first frame. Restriction: Semicolons and // are not allowed in comments. - The following attributes are used to in creation of the frames. They can not be stored in the gif. If you are using them then it is important to save a backup of the file as .pdn document. All following layers will be merged with this layer to form a frame. You can use this attributes on different layers. All preceeding frames will be merged with this layer. You may set the user environment variable 'ImAGIF' to 'TileInfo'. This adds on load more attributes to the layer title: Frame window, disposal method, and size of the frame data block. These attributes are just informative and not used on save. There is a variant for APNG and AWEBP but let's first get this to run. The main question at the end. Is the handling of the animation attributes via the layer titles understandable? Looks interesting, especially the support for transparency. I'll check it out when I get home. Just to say, your plane sigs will shrink just by 100 to 200 bytes. Gifsicle with best optimization is about 20KB. Nowadays not so important if we are talking about gifs larger than 1MB. I tried it in PDN version 4.0.5 running Win 8.1 x64. I'm getting errors, no settings adjustments. It just shows a preview screen, a button for default, a button for more plugins like this, buttons for OK and cancel. That's all I get, no options for adjustments of any kind. That's absolute correct. All settings are controled via the layer titles (names). I hope you are not getting any exceptions and there is just a missunderstanding how the plugin gets its settings. Open the 'Layer Properties' dialog of the bottom layer and add to the name "// 3000ms" or "// duration=3000". Maybe you also like to add a comment then you may add instead "// 3000ms; comment=Created by racerx"
Don't add the double quotes. Open the 'Layer Properties' dialog of the second layer and add to the name "// 100ms" or "duration=100". Save will then read these values from the names and use them to create the frames. If you open this saved agif (or any other) then the layer names will be created from the values in the file and you will see the durations and comments. I agree there is a documentation with examples needed. For sure the 'Defaults' button has no meaning in this dialog and may be confusing. But there is nothing you can do against in a filetype plugin. Anyway it works well so far. There will be a maxcolors setting (default 256) together with the color quantization feature. That's needed if you like to optimze your gif for size. Thanks for pointing out that's important to make it more clear to the users that there are no settings in the dialog. As you may have seen, I updated the dialog already. That's the kind of feedback needed for developers. The biggest problem I have right now is getting all my layers to confirm to 255 colors. I don't know of a way to globally do that in PDN. Some of my animations could have 300+ frames and it is a PIA to apply a filter to each layer one at a time. Maybe there is a way I've overlooked? The missing color reduction is a no go. As far as I know there is no Color Quantizer plugin. Will do one in the future. Or TR may add something to TR's Color Reducer v1.0 to allow larger palettes (if we are asking nicely). As far as I know this one is also used in paint.net. Still there is nothing you can do and publish which works on multiple layers. 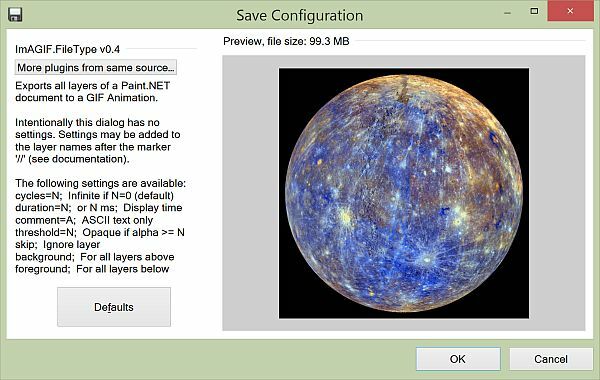 - Added 'Animating in paint.net is easy.pdn' to demonstrate usage of background and foreground settings. 'Animating in paint.net is easy.pdn' in the zip has a background and froreground layer and the animated layers inbetween. The GIF above has been created with maxcolors=32 (the original has around 1200 colors). Thanks for the update, I like it! The swinging effect is quite nice. I like it. Especially because the letters are swinging independently and the shadows are quite real. What's about to publich a version with a transparent background? So people could easier adapt it. I'm not sure if it works because gif has no alpha transparency. But maybe we could test this. The tool will get some additional effect commands in the future. But for sure just simple ones like fading or moving. It's too bad that we can not publish an effect which can access all layers. You always have to use reflection to implement an animation player tools effect. I had to export to 32-bit PNG image sequence. I then imported into Paint.net and saved as a pdn file. It has full transparency and is all set up to use with your plugin to export. Very nice set of transitions Midora! Thanks. Thanks for the update. Great idea putting the commands and descriptions in the ReadMe file. The transition command makes quick work of two image animation. The transition command makes quick work of two image animation. Could you post the command you used to make that? I'm trying to replicate the effect. The reason for the first 50ms is that in the moment all transitions run for 1 second with 20fps (means 50ms per frame). If you need a different speed then generate the gif, load it (which means you will get the flat variant with all frames), change the duration of the first frame to your needs and save it again. "%~dp0ffmpeg.exe" -i %1 -r %fps% -loop %loop% -vf palettegen=max_colors=%colors%:reserve_transparent=1:stats_mode=full "%%~di%%~pni-palette.png"
"%~dp0ffmpeg.exe" -i %1 -i "%%~di%%~pni-palette.png" -lavfi paletteuse=dither=bayer "%%~di%%~pni.gif"
Also I tried to animate a bouncing ball with transitions, but gave up and did it manually instead. For sure color quantization is not enough. What's missing in the next step which maps the pixels to the generated colortable is dithering. This will be in before we publish a version 1.0. The motivation of transitions is to easily create slideshows. What you are looking for is something different. This may be something for a later version. Your bouncing ball combines two different effects. Moving along a path and stretching when the ball reaches the bottom. In the moment the plugin just supports you in the way that you can separate the ball from the background. So you can concentrate on the animation of the ball and then later set or exchange the background. !!! I'm speechless. So many frames. Thank you so much. 375? A little bit strange ;-) I would expect 360 or maybe 372.